"Rai... RaichuLatias!? Woooo!" Max greeted him warmly and stood nearer to him. "Well, you should know more than me about this place, you being a mod and all." Max looked around one more time. "This place is randomly starting to give me to heebejeebees." "It's not that bad, Maxie, we just have to watch out for-" Stopping suddenly, Flarey looked behind her. She'd heard - or to be more accurate, felt something. Like someone watching her, or something like that.. Shaking the feeling away, she wondered what she'd been about to say. "Don't worry, so long as that manic Porygon doesn't turn up again, we'll be fine. I just hope no Global Mods or Admins got sucked in this time.."
Watching the scene on one of many screens mounted on the wall, the young man stroked his chin thoughtfully. His cold voice broke out again, any warmth in its sound extinguished by the cold, cold glint in his cat-like eyes. "Nido, does that girl look familiar to you?" The green Nidoking growled, peering at the screen. It shook its head, moving the sit next to the young man's chair. The man put a hand on its back, thinking. "I am sure I have seen her before somewhere. I will have Raitios bring her to me, along with her computer." Raising a long-fingered hand to his head, he pressed a button on a communicator clipped to his ear under his long golden hair and spoke into it. "Raitios. Bring me that girl, along with her computer. Do not fail." "Lol Manic Porygon." Max imagines it randomly and laughs. "Wonderous..." Max stepped back suddenly. "Vibes, I feel bad vibes damn it." Max released his Hypno in an instant. "Hypno, you feel anything?" Hypno nodded slowly. "Well I cant tell what it is... Just keep an eye out..."
In a dark room, one wall dedicated to large screens displaying different areas of the forums; another wall covered in switches and controls - Flarey awoke to find herself in a cage. "W-what's going on..." she whispered, sitting up slowly and rubbing her head. The last thing she remembered was a boy who looked like RaichuLatias grabbing her, and a Pokemon, and Alakazam, teleporting her away. She didn't remember anything else, save for a bright light, and a streak of pain all through her body..
[color=#00af33]"I see you have awoken." a cold voice said. "I must admit, I am impressed. Not many have woken so soon after being attacked like that. But please, I am getting ahead of myself. Allow me to introduce myself - or should I let you. ..?" Leaving the question hanging in the still air, the body belonging to the cold voice rose from a high-backed chair in front of the screens. A dark figure moved over to the cage, the dark room throwing his face into shadow. As he stepped closer, a beam of light fell across his face, and Flarey gasped. She knew that face - the long, golden hair, the side parting in it that had been known as the combover, those cold, cat-like eyes..
"The Editor.." she whispered, a chill running through her. The Editor was a character she'd created herself - he was the evil version of the Combover Kid, a character from a comic book series she'd made up. "Very good." he said, nodding. Dressed in a long, emerald green coat over black pants, with a long, flowing cape over his shoulders. "And welcome to you.. Quiller." Last edited by Flarey on Fri Mar 24, 2006 10:00 pm, edited 1 time in total. Hypno stopped looking around suspiciously and its pendulum stopped swinging around. "Ah, maybe it was just a passing thing... I cant feel anything anymore... Maybe somebody got to the error page or something like that..." Max smiled randomly and looked back to RL. "Im Rubypoke, but call me Max.. ^_^"
Raitios just stood there for a second or two trying to think of what to reply to what seemed like 8 people trying to talk to him at once. "Honestly, I haven't a clue on how I even got in here, I've been walking around for awhile, though I bumped into some girl, then that Alakazzm grabbed me and teleported away to a room on the other side of the forum." Raitios then took a step back towards the wall, he was trying to see if he could get the people separated a bit. "Heh, of course everyone comes to greet me, even though I only wanted one of them." Raitios said in his head. Raitios also backed away a bit when Darth extended his hand. "Sorry, Not that I don't trust you or anything, but last time I touched something by the hand I get Electricuted. "Raitios replied to Darth. Just as Raitios finished talking, something began to ring in his Pocket. "Oh, um this dumb thing has been going off for some reason, I'll see if I can turn it off real quick" Raitios said a bit nervously and ran through a hole in the wall, which appeared like magically for him. Raitios then pulled out some sort of Device out of his pocket and held it up beside his head. "And don't bug me while i'm working, you dope, I don't care what rank you are in the team, you do not command me what I do. I'm getting the computer and getting out of here, you deal with the girl.". Raitios then turned off his communicator, before the person on the other end could reply and went back into the room. "Okay, I think it's off now, so what's going on now?" Raitios said with a fake smile. Raitias followed Jeff until they both stopped on a platform inside the lab, which then went up 5 levels to where the Registeel robot was. Raitias was a bit amazed at the size of the robot, but he didn't let any expression out, since he didn't think his clone would've. A guy in a White lab coat then walked up to Jeff, "We've got everything ready, it'll be enough to get "It" for the boss for sure, as long as no one interfers with our plan" the guy in the lab coat said to Jeff. The guy in the lab coat then brought Raitias and Jeff closer to the registeel robot. The robot looked a bit scary, with the sharp claws, and almost evil face, plus the size of it was alot bigger than Raitias had ever seen anything as. "Though the only problem is, we can't fit it in the room to help get "It"." the guy in the white lab coat said to Jeff a bit worried. "Eh, doesn't matter they'll eventually get into a big area, heh right now they are still probably cowards trying to find a way back to their homes." Jeff replied a bit evilly. Jeff and the guy in the white lab coat started to walk around the robot, Raitias didn't follow them, instead he looked for a way in the robot. Raitias eventually found a ladder on the back which led up into it's head and started to climb it. While Jeff and the guy in the lab coat were talking, Jeff noticed Raitias had disappeared. "That's odd, heh I wish he didn't do this every couple minutes, I'll call him up on his communicator then." Jeff said, then he pulled out a radio-looking device out of his pocket and pressed a button on it. "You idiot! You just ruined the plan, Why can't you leave me alone while I'm working?" Raitios replied very angerly. "Whoa wait, why don't I come with you, Raitios? What are you working on now? And why didn't you tell me while I was around you." Jeff replied. "I'm not anywhere near you, fool. Let me guess, someone else is there who looked like me?" Raitios replied through the communicator in an angry tone. "Um, yeah, I thought it was you, you said you were in that...." Jeff said and then looked for Raitias again. "Oh great he's gone where did he.........The Robot, somebody get in there now!" Jeff shouted out very loud. Raitias was just about to go in when he heard Jeff shout, suddenly a Red light and an alarm blazed throughout the lab. Raitias climbed as fast as he could into the Robot and slammed the door shut. "Okay, so I'm guessing they know i'm here, or someone else got in." Raitias said to himself in a sarcastic way. Raitias then sat down in a chair and started to look on the controlboard next to the chair. "Oh great, none of these are marked either. Oh well, I guess i'll have to hit random buttons then." Raitias thought to himself. Just then something in his backpack started moving, Raitias then opened the zipper to find the 2 Pichus in there. The Pichus then threw out around a dozen empty Lemonade cans and jumped out of the bag. The second Pichu ran on the controlboard and sat down on a red button and began to drink another Lemonade. Just then, A loud sound came from the bottom of the robot. "He's in there and he has started it, everyone get out of the way, quick!" Jeff yelled from the ground. A fire ignited from the bottom of the Robot and the robot began to move forward. All of the people were running away from the robot now. "Aw, Pichu why did you have to do that" Raitias said to the one sitting on a Red button. "Pee...........Choo......." the Pichu replied as if it drank too much lemonade. Raitias then sat down in the chair and moved the tired Pichu off of the Red button. Raitias then grabbed what looked to be a control of some sort that had markings on it that said "Forward, Right, Left and Reverse". Just then the Robot shot off through the lab, destroying the walls as it went through the huge lab and landed in Viridian Forest. Meanwhile, at the other side of the forum. Raitios yelled very loudly into the communicator at Jeff and closed it. "Heh, so I guess you know the truth now, but it won't help ya get out of this mess." Raitios said, while being a bit frustrated on what had happened. "Now I'd suggest handing the computer over and come with me, Flarey Girl, or I'll have to take you with me, My Way." Raitios continued, then pulled out a Gray remote and pressed a button on it. The room filled with Unowns for a couple seconds, the Unowns stopped in the middle of the room and connected to each other, forming a wall in between Flarey and the others. "RL, what are you doing?" she asked, partly in bewilderment, partly in fear. "You can't have my laptop, RL..." Watching him nervously, she wondered what on earth he was doing, and why he seemed so desperate to acquire her computer..
"You heard me, hand it over now, or i'll play around with this remote, until the room starts on fire!" Raitios yelled a bit evilly with the remote in his hand. Raitios then walked a bit closer to Flarey. "Your little friends can't do anything to help you now, and it appears the other "me" has abandoned you too." Raitios then pulled a Pokeball off his belt and threw it on the ground. An Umbreon popped out of the ball, except it was Red. Raitios continued "This Umbreon is alot more mean than any other Pokemon you've seen so far, it's even knows Crunch." The Umbreon stood there focused on Flarey the whole time, ready to use pursuit if she tried to run. "And the Unowns now know a new move, let's just say you don't want to know what it is." Flarey started to say something but stopped as what he had said sunk in. "The.. other you? You're not .. RL.." A chill ran down her spine as she looked down at the red Umbreon, then back up to this clone of RaichuLatias. "Who.. what are you then?" she whispered, scared for real now. Realizing what he wanted, she moved a hand down to her waist. Moving as fast as she could, she threw the Luxury and Ultra Balls into the air. There was a blinding flash of light, and a low growl, and Flarey made her move. When the light had faded, the Umbreon was unconscious on the ground, a blue shape was speeding out of sight around a corner, and Flarey was trying desperately to find a way around the barrier of Unown, computer bag over her shoulder still. "Whoa! what?" Raitios said as he found his Umbreon laying on the ground. "You idiot! how could you faint from that?!" Raitios yelled at the umbreon and then returned it to it's pokeball. "Heh those Unowns won't give, unless you have a Remote like mine, which in your case you don't." Raitios said while holding a Great Ball in his hand. "Fine, then this isn't exactly my way, but it'll do. Go Alakazam!" Raitios yelled out and threw the blue ball on the ground. An Alakazam popped out of the ball. "Alakazam take care of her! You know what to do." Raitios commanded his pokemon. Alakazam lifted it's spoons up and let out a Confusion attack on Flarey. Flarey gasped in fear as she felt herself lifted into the air. "Maxie.. help.." she choked out, but the effect of the attack was preventing her moving enough that she could hardly speak. "Maxie... find.. Sound..." she whispered, struggling to free herself from the Confusion. Alakazam then moved over to Flarey as quick as it could while keeping her floating in mid-air with Confusion. "Alakazam, Use Teleport!" Raitios commanded his pokemon. Alakazam then grabbed Flarey and began to glow. After a couple seconds both of them disappeared. Raitios laughed a bit and went out through a hole that just opened up in the wall. "Good luck losers!" Raitios yelled out as he left. Alakazam landed in a big dark room with computer monitors on one wall. Alakzazam then dropped Flarey and heard a command "Use Thunder Wave!" Alakazam then let Flarey out of the Confusion attack and dropped her roughly on the ground and then charged up and let a burst of electricity out on her. Crying out as the attack hit her, Flarey fell to the ground and lay unmoving. Her breathe came in hosrt gasps, and she clutched her Amphy plushie in one hand, wondering what was going to happen to her. "Well, well, well." the cold voice said from the chair in which its body sat. "We meet again - Quiller." Rover looked stunned at what just happened. "Where did she go...?" She asked, nervously. Rover then noticed something...her and Max were on fire! "AHHHH" screamed Rover. "Azure, watergun!" Her Vaporeon charged at them and pumped out a bit too much water, and Max and Rover were knocked down by an intense water gun attack. Rover stood up and rubbed her head. "So...what are we going to do now? Now we have to find Kirke, RaichuLatias, and Flarey. I hope all of them are okay..."
"Darth? What in the world..!" Jodi ducked under the fire blast, missed most of it, and then got knocked over by part of Azure's water gun. Standing up and wiping the water off her face, she turned to Rover. "What in the blazes was-" She stopped, seeing that they were both slightly smoking. "In that case, thanks to the Vaporeon, and let's go. Flarey's gone, Raitias's evil clone is out here pretending to be him, and Kirke is alone in Slateport market. Let's go find him before something can happen to him." If nothing has already..
Max shook around to get some of the water off of him. "Bit cold eh." Max then stepped forward and looked around vigorously. "Flarey?? FLAREY!?" Max started pacing to and from places around the room. "We must find her, along with all the other people lost here!" "Well, if that guy back there wasn't Raichulatias, then he and Flarey might be in the same area. They were both taken by Alakazams. Let's go find Kirke- Darth says he's in Slateport market, so at least we know where to look." Jodi got up and went to the door. It didn't dissapear, so she opened it, and held it open for the others. "To Slateport then!" Max turned and paced to the door, looking back quickly then pacing through. Darth hesitated to study the area. a bunch of knocked out unown, scorched blue floor, bits of ashes, Then Darth spied a candy wrapper near where Flarey had been. "Hmmm....." Darth slipped it into his pocket for no particular reason. He hesitated for one more minute, he'd really like to question a unown. He dismissed the Idea when he realized that he'd have no way of understanding what it said, and started off toward Slateport. it didn't take long to get there. "Well, now that were here, now what do we do?" he said, as he did not see Kirke. "What do you think? We look for him. Kirke!!" With that, she strode off down the main street. There was so much to look at! Bright banners, colorful sigs, and fusions in little cages yapping at them. She wanted to stop and look at everything, but she had to keep looking for Kirke. She yelled for him again, and looked around again. There was Kryten and Rubypoke's shop, a few small new places, and a big place with a sign over it; '~Sentosa~ NO REQUESTS NOW'. "I wonder when Flarey was going to re-open that place. KIRKE!" She looked around again. "I wish I knew what he looked like." Raitios then pulled out his communicator from his pocket and placed in by his mouth. "Okay, there happy? I got the girl for you and the computer, Now if you don't mind, I have some business with my other self." Raitios said into it while he walked away for the opening, that went towards the "Lab2". A message came back after he was talking "The person you are trying to contact is away, please check back later, your message has been recorded." "Heh, how come he gets that? I really needed that a bit ago, and it'd be nice if Jeff didn't bug me 24/7 about every single thing." Raitios said to himself as he went through a Door that said "Viridian Forest". The robot eventually got caught on a tree and stopped. Raitias who was trying to hold on to the chair, while holding on to the Pichus, then got up and opened the door. The Pichus just watched as he went out, and right as Raitias started to go down the ladder, the robot started up again. "Whoa!!" Raitias yelled while trying to hold on to the ladder. The robot was starting to push through the tree it got caught on, Raitias was about 30 feet from the ground at this time. "Eh, I going to have to get off of here right now!" Raitias said as his hands started to slip. 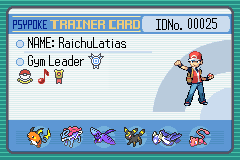 Raitias pulled a Master Ball off his belt and called his Latias out. Latias let out a cry and stayed close to Raitias, as he climbed down the long ladder. The robot was vibrating alot now and it became very hard for Raitias to even hang on. 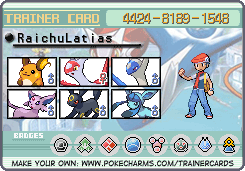 Raitias then called Latias to come close to him and then he jumped on Latias. Latias then went to the ground as fast as it could and dropped Raitias on the ground safely. Raitias then commanded Latias to go back up to the top of the robot to get the Pichus out of the Robot. Latias flew up to the door on the robot and used Psychic to open it. Latias then used Psychic to move one of the Pichus on it's back. The Pichu was still a bit slow, due to the Lemonade it drank. Right as Latias got the first Pichu out, the Robot shot off through all of the trees with the other Pichu inside. Raitias backed away as the robot shot off with the other Pichu in it. Latias then came down with the other Pichu, looking a bit sad it wasn't able to get the second Pichu. "You really need to learn not to drink so many Lemonade, Pichu." Raitias said to the mouse pokemon and sighed a bit. Raitias then picked up the Pichu and put it in his Backpack. Then he hopped on Latias. Raitias then commanded Latias to go after the robot. Latias, with a cry, then flew off with Raitias on her back, evading the trees while she flew. After a couple minutes of flying, Raitias spotted a Fearow in the distance to the right of him. "That's a bit odd." Raitias said as he watched the bird pokemon. The Fearow then came a bit closer and let out a loud cry. Then alot of Spearow came from the trees. "Ok, that's definately not good!" Raitias said as he gave Latias a signal to evade the Bird pokemon, which then started to chase after Latias. Inside Raitias' backpack however, the Pichu was in there digging around. "You know, it'd help if you could actually battle Pichu, instead of drinking all of the Lemonade." Raitias yelled out. The Pichu then pulled the zipper on the backpack from the inside and stuck it's head out. "Hey, get back in there!" Raitias yelled at the mouse pokemon. Pichu then pulled out a Gray Can and threw it out into the flock of Spearows. The Spearows all fell to the ground and let out a cry, the Fearow however disappeared. Latias then slowed down as Raitias watched the Spearows fall to the ground. "Ah.. Slateport Market..." Max smiled at all the glowing signs and random objects floating around. He looked into his shop and found a robot that looked like Kryten giving out glowing trozei sigs. "Kryten has a robot? So thats how he gets all the requests done quickly..." Max laughed and walked on, bashing into the door of Sentosa. 'No More Requests Please'. Max sighed sadly and walked on to trail with Jodi. Darth was going through shops when he reached a sign which read: M_M&L_C's Shop. "Oh Boy!" Darth was really hungry, so he rushed inside and bought some chocolate Pokemon. "Mmm! Good!" He said as he nibbled on a Pikachu ear. He stockpiled a few more Chocolate Pokemon and left, slipping the chocolate boxes into a bag. "Hey Guys! Where's Rover?" He called to Max and Jodi, mouth half full with Chocolate.